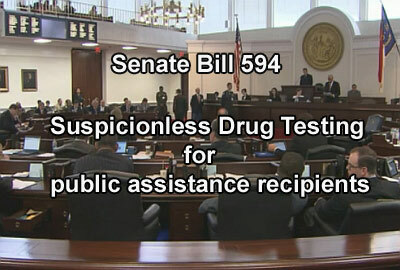 A bill was introduced in April that would have required all North Carolina welfare applicants to be able to pass a drug test in order to receive benefits. Lawmakers said that the reason they wanted to implement this action was to make sure that law-abiding citizens got public aid before people who were abusing drugs and breaking the law. 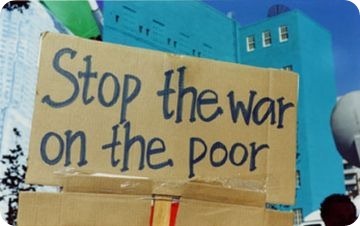 The bill really caused an uproar around the state, leading some to call the bill a war on the poor. Due to the legal problems that came up with the new drug testing requirement, lawmakers finally decided to give the bill a bit of a facelift, but did it really do anything to help? The controversial bill, known as House Bill 392, sets up some serious rules for anyone in NC who wants to apply for assistance. Social Services workers were suddenly required to do background checks on anyone who applied for Work First benefits or food stamps. It was the state’s way of ensuring they were not on parole, probation violators or walking around with current outstanding warrants. In addition to mandatory background checks, the bill goes even further by requiring the drug testing of “suspected” drug abusers applying Work First assistance. This provision came about from an earlier bill the North Carolina Senate passed in April that required each and every Work First applicant to be drug tested. This only brought on more problems for the state and Work First applicants. For example, urine drug screens are notorious for false positive results among vegans who include legal and nutritious hemp seeds to their diet. Once lawmakers realized there were going to be legal problems with drug testing all applicants, the House decided to insert a new version of the testing requirement in the background checks bill, requiring only “suspected” drug abusers to be tested. People who oppose the bill say that it could keep people who really need assistance from applying for Work First. This is especially frightening given everything that has happened in the last few weeks concerning North Carolina’s unemployment system and the thousands of people who are now without those benefits. They believe that it is turning the Social Services office into an extension of the police department. For an organization that is supposed to be providing family support, it doesn’t seem that drug testing and running warrant checks quite fits in the program. The House Bill says that, when it comes so pinpointing suspected drug abusers, Department of Social Services (DSS) need to go back a period of three years and look for past convictions, arrests or warrants that are drug-related. If they see anything they feel is suspicious, they can immediately require the Work First applicant to take a drug test. 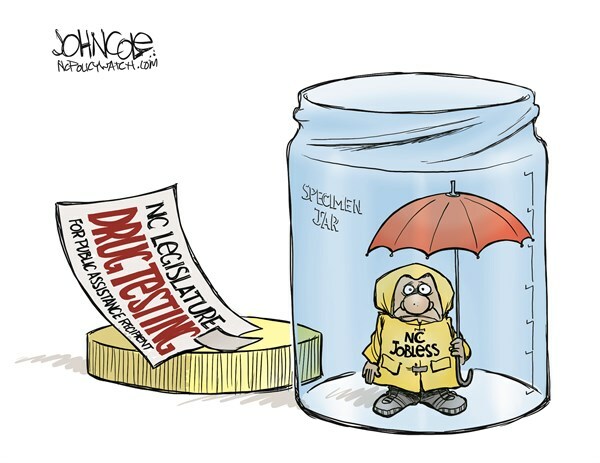 Each time an applicant is ordered to take a drug test, they are also required to pay for it. The fees for drug tests run approximately $100, but that can vary depending on the type of test that is ordered by DSS. If the applicant passes the test, they will eventually be reimbursed for the cost. Anyone who fails will be denied benefits for at least one year. Children who have a parent that fails the drug test are still eligible to receive benefits. While the new version of the drug testing bill does not require every applicant and recipient to take drug tests, it does seem to bring up a lot of questions about civil liberty and what constitutes a “suspected” drug abuser. It also doesn’t specifically state that DSS workers can only test those applicants who have warrants and convictions on drug charges…it just says those types of warrants are one thing DSS workers can use to justify reasonable suspicion. Another issue is that the language of the bill seems to try and talk people out of applying for Work First benefits as soon as they come in the door. For example, the bill says that a DSS worker has to advise every applicant that they can avoid the hassle and expense of drug testing and background checks if they opt not to apply for the Work First Program. That seems to be a sneaky way of saying you can save time and money if you just don’t bother to apply for assistance…which is odd, considering these services were specifically set up to provide assistance to families who were already financially struggling. No matter the argument, the bill will be voted on this week. If it does pass, it will go to the NC House for negotiations. If you are struggling with unbearable amounts of debt and are unable to pay your bills, it may be time to consider bankruptcy as an option. By filing a Chapter 7 bankruptcy, your unsecured debts are discharged and you can finally get some breathing room. Reach out to a local Chapel Hill bankruptcy attorney today and find out how bankruptcy laws can help you.